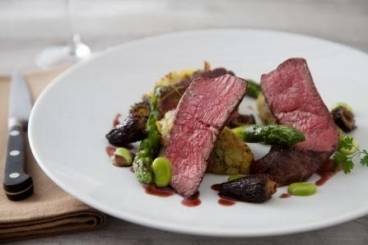 Tender fillet steak with minted and crushed ratte potatoes, seasonal vegetables and a rich, reduced morel mushroom sauce. Pick and finely chop the chervil. Blanch the broad beans for 3 minutes in boiling water and then refresh in iced water. removethe pods from the shells and keep refrigerated. Prepare the asparagus by breaking off the woody base of the stalk. peel up to the tip and then cook for 3 minutes in salted boiling water. Refresh in iced water. To serve: Gently reheat with butter and finely chopped chervil. Peel and finely dice the shallot. Peel and puree the garlic. Sweat in a pan with the picked thyme. Add the morels and cook until tender. Deglaze the pan with the red wine, reduce the wine by half and then add the stock. Bring to the boil and then reduce until thick and glossy. Carve the beef to show the correct cooking. Place the potatoes into a rectangular mold and lay the beef on top. Drizzle the sauce around and garnish with the vegetables and fresh chervil leaves.